Russian heavy-lift orbital launch vehicle. In 1962 Vladimir Chelomei proposed a family of modular launch vehicles. In January 1969, Chelomei was proposing the UR-900 for the Mars expedition. A garbled description of this launch vehicle appears in Chertok's memoirs. 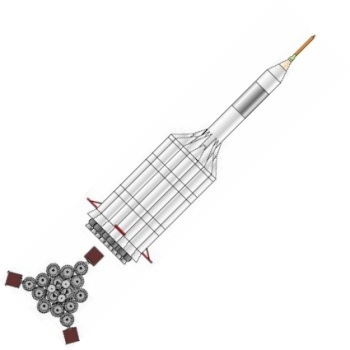 This would seem to be a version of the UR-700 moon rocket using 15 RD-270 modules in the first and second stages in place as opposed to the nine modules of the UR-700. The third and fourth stages were derived from the UR-500. The booster could deliver 240 metric tons to low earth orbit. Status: Design 1969. Payload: 240,000 kg (520,000 lb). Thrust: 94,000.00 kN (21,132,000 lbf). Gross mass: 8,000,000 kg (17,600,000 lb). Height: 90.00 m (295.00 ft). Diameter: 28.00 m (91.00 ft). Apogee: 200 km (120 mi). In 1962 Vladimir Chelomei proposed a family of modular launch vehicles. The UR-700 was designed for direct manned flight to the surface of the moon. While approval to proceed with development of the UR-500 came in April 1962, no such go-ahead was received for the UR-700. Chelomei convinced Khrushchev in September 1964 to have the UR-700 re-examined. Unfortunately for Chelomei, Khrushchev was ousted from power a month later, and Korolev's N1-L3 was selected for the lunar landing mission. The next chance for the project to be considered came on 16 November 1966. Study index number 4855CC by TsNIIMASH in 1966 showed that any development of improved versions of the N1 would be practically equivalent to design and qualification of a new rocket, while the UR-700 modular approach allowed a range of payloads without requalification. The UR-700/LK-700 combination could support the DLB lunar base better, as well as Venus/Mars manned flybys and Mars landing expeditions. Glushko and Chelomei advocated development of the UR-700 in lieu of the N1. It was agreed that engine development and studies of the UR-700 could continue. Development of the UR-700 was on 17 September 1967. However no go-ahead to proceed past the design phase was forthcoming in 1968. By January 1969, Chelomei was proposing the UR-900 for the Mars expedition. A garbled description of this launch vehicle appears in Chertok's memoirs. This would seem to be a version of the UR-700 using 15 RD-270 modules in the first and second stages in place as opposed to the nine modules of the UR-700. The third and fourth stages were derived from the UR-500. The booster could deliver 240 metric tons to low earth orbit. Less than three months later, on 2 April 1969, the unimaginable happened. A Proton rocket, one tenth the size of the planned UR-900, was launched in an attempt to send an unmanned probe to Mars. The leadership of the Soviet Rocket Forces and most of the Chief Designers were present for the event. The Proton rocket lifted off, but one engine failed. The vehicle flew at an altitude of 50 m horizontally, finally exploding only a few dozen meters from the launch pad, spraying the whole complex with poisonous propellants that were quickly spread by the wind. Everyone took off in their autos to escape, but which direction to go? Finally it was decided that the launch point was the safest, but this proved to be even more dangerous - the second stage was still intact and liable to explode. The contamination was so bad that there was no way to clean up - the only possibility was just had to wait for rain to wash it away. This didn't happen until the Mars 1969 launch window was closed, so the first such probe was not put into space until 1971. This accident seems to have made a powerful impression on the military, and plans for a new generation of space launchers drawn up in the early 1970's specified use of non-toxic liquid oxygen and kerosene propellants. This also forced Chelomei to specify these propellants in the redesignated UR-700M for the Mars expedition. LEO Payload: 240,000 kg (520,000 lb) to a 200 km orbit at 51.00 degrees. Family: heavy-lift, orbital launch vehicle. Country: Russia. Agency: Chelomei bureau. Bibliography: 367, 443.